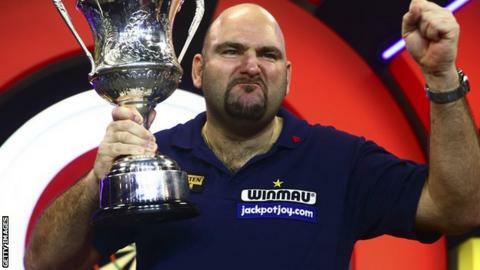 Scott Waites was delighted to clinch a second BDO world title, admitting it seemed "a million miles away" following shoulder surgery last year. Waites thrashed Jeff Smith 7-1 in Sunday's final at Lakeside. The 38-year-old from Huddersfield had an operation on a rotator cuff problem in February. "I had six weeks without throwing a dart - that's painful in itself. Now I'm taking the world title back home," he told BBC Sport. "It's hard trying to come back from an injury and trying to get yourself to practice. Sometimes, no matter what you do, your body won't react with it." Waites, who added to his previous Lakeside success from 2013, continued: "This week, I've prepared myself to play for two hours in a session and it's so difficult to do. My shoulder and my body wasn't happy with that. "After I played Glen Durrant [in the quarter-finals on Friday] I ended up going to sleep at half past eight." Waites, who was the ninth seed, is the eighth man to win the BDO title on more than one occasion. He raced into a 5-0 lead in the final against unseeded Canadian Smith, 40, and eventually wrapped up a comfortable victory. "It's not really sunk in yet," said Waites, who will return to his job as a carpenter on Tuesday. "I can't believe it was over so quickly. I set myself up for it being a really tough game and Jeff, although he pushed me a little bit, didn't take his opportunities. "I took my opportunities when I got them and I was taking sets."